Pasadena, CA - In light of today’s announcement that Europa is likely spouting its vaporized ocean water into space, The Planetary Society calls on the White House and Congress to approve a new mission to explore this enigmatic moon of Jupiter to better understand its potential to support life. With today’s discovery, Europa has made it easier for visiting spacecraft to study its habitable environment. Previously, the only known way to sample its liquid-water ocean was to land and drill through the ice – a complex and difficult endeavor. 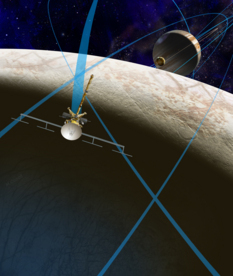 But now, a spacecraft has only to fly through Europa’s plumes to collect samples of water vapor which it can analyze for organics and other molecules. Despite a long history in popular culture (from Arthur C. Clarke’s sequels to his iconic “2001: A Space Odyssey” to the recent movie “Europa Report”) and decades of study within the scientific community (Europa was named one of the top priorities for planetary exploration in 2011), missions to explore Europa have never moved off the drawing board. But NASA has spent the past few years homing in on a new, lower-cost spacecraft called the Europa Clipper. If approved next year, it could be ready to launch as early as 2021. In addition to unparalleled scientific return, a mission to Europa would engage a wide variety of assets throughout NASA. The Space Launch System (SLS) could launch a Europa mission on a direct trip to Jupiter, avoiding an extended and costly cruise phase that loops it by Earth and Venus. Space-based telescopes like the Hubble Space Telescope and the upcoming James Webb Space Telescope can provide invaluable data to inform the instrument design on a Europa spacecraft and provide supporting datasets as the spacecraft directly studies Europa. The Cassini spacecraft at Saturn can provide additional data to help understand the behavior of similar jets found on the moon Enceladus. Today’s result already demonstrates the value of a cross-disciplinary approach to planetary science, and The Planetary Society congratulates the scientists behind this discovery. "As a user and supporter of the Hubble Space Telescope, it's extremely satisfying to see this kind of outstanding continuing support for planetary science coming from that telescope,” said Planetary Society President Dr. Jim Bell. “And as a planetary scientist interested in astrobiology and Europa, it's thrilling to see this kind of evidence come to light. It's even more evidence that Europa may be a habitable world." Europa may be one of the most habitable environments in the solar system. Beneath its icy crust, the moon may contain more liquid water than in all of the Earth’s oceans. This water is in direct contact with the rocky core, which is heated by stresses caused by Jupiter’s gravitational pull. Liquid water and heat are two key ingredients to sustain life as we know it. The Planetary Society has worked to restore funding to NASA’s Planetary Science Division cut by the White House in recent years. The Society’s recommended budget of $1.5 billion – less than 10% of NASA’s total – would sustain both a Europa mission and the Mars 2020 rover, which will take Mars science to the next level by collecting samples of Mars for eventual return to Earth. The current White House budget request for Planetary Science is $1.2 billion – not enough to support a mission to explore Europa. Today’s astonishing announcement only heightens the need to explore this unique moon. The technology exists, the plans have been made, and Europa itself has now made it easier to sample one of the most potentially habitable environments in the solar system. The Planetary Society calls on the White House and Congress to fund this compelling mission. We only need to decide to go. To learn more about recent budget cuts to NASA’s Planetary Science Division and to contact your elected officials in support of a Europa mission, please visit planetary.org/SOS.